Am 5. November findet in Großbritannien die Bonfire Night statt. Hier lernen Sie das Vokabular rund um diese Tradition kennen. Do you know what happens in Britain on 5 November? We present language to talk about Bonfire Night. Do you know the rhyme “Remember, remember, the fifth of November. gundpowderSchießpulverGunpowder, treasonVerrattreason and plotVerschwörung; sich verschwörenplot”? 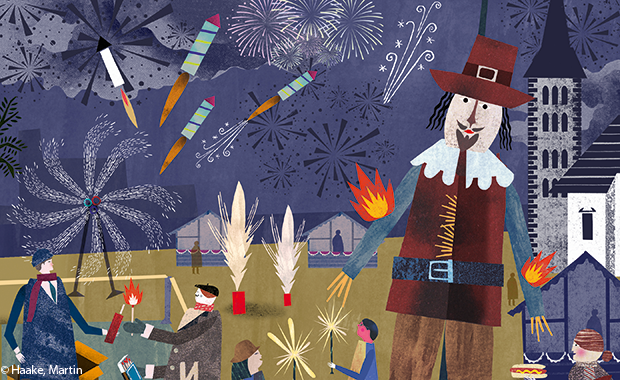 Bonfire Night, or Fireworks Night, to commemoratefeiern, gedenkencommemorates the gunpowder plotSchießpulververschwörungGunpowder Plot of 5 November 1605, when Guy Fawkes and his fellow Roman Catholic conspiratorVerschwörer(in)conspirators plotted to to blow upin die Luft jagenblow up the Houses of Parliament, with the Protestant King James I inside. The barrelFassbarrels of gunpowder were discovered, the plot was to foilvereitelnfoiled and the conspirators were to executehinrichtenexecuted by the traditional method for traitorVerräter(in)traitors — they were hanged, drawn and quarteredgehängt, gestreckt und gevierteilthanged, drawn and quartered. Some Catholics prefer not to take part in Bonfire Night events, especially where the traditional “guy”— an effigyPuppe, Nachbildungeffigy of Guy Fawkes — is burned. For most people, the events of 1605 are just a good excuse to to let offabfeuernlet off some fireworks, to enjoy the heat of a blazingloderndblazing bonfire and to watch the flameFlammeflames to leapspringenleaping into the night sky. The fireworks display to lastdauernlasts for only a few minutes, but it’s the grand finale of the evening. Rockets to shoot upemporschießenshoot up into the night sky and explode into a thousand stars. The whizzZischenwhizzes and bangKnallbangs of the fireworks are followed by gasphörbares Einatmengasps and cheerJubelcheers from the watching crowd of people.